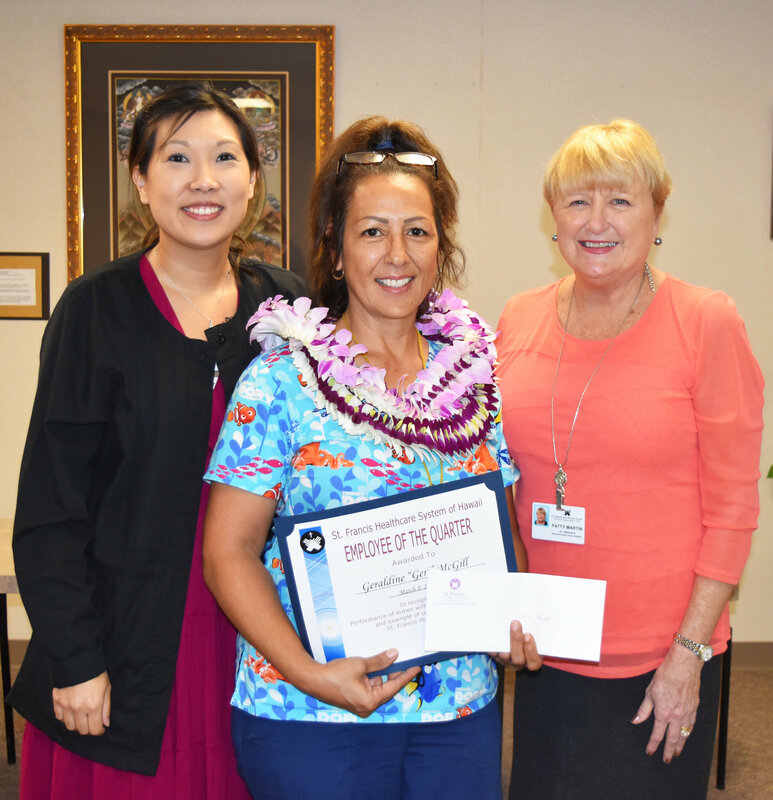 Congratulations to Personal Care Attendant Geraldine “Geri” McGill, who was named St. Francis Healthcare System’s Employee of the Quarter for the fourth quarter. She was presented with the surprise announcement on March 8 by Patty Martin, Vice President – Mission and Organizational Effectiveness, and Becki Murashige, who oversees St. Francis Health Services for Senior Citizens (HSSC), which includes the bathing and personal care services. Geri, who provides baths for seniors in their own homes, is known for providing outstanding quality service. As a way to help preserve a sense of independence for frail elders, she encourages them to undertake some aspect of their care on their own, whatever they are capable of accomplishing with as little assistance as possible. This also helps ensure they do not lose their ability for self-care. Regardless of the level of active participation from the elder she is supporting, Geri ensures a non-rushed, extremely thorough bathing experience. She consistently gives a little extra without making it appear like she is. These “extras” may include a longer back rub, talking story as she lets warm water spray on their back for a few extra minutes, a quick hand or foot massage as she applies lotion, taking two minutes to carry laundry upstairs for someone, or scooping a litter box quickly, even though a client’s daughter will be coming later in the day to attend to it. In the world of healthcare, there is a lot of documentation for reporting purposes, and Geri always takes the time to submit detailed reports on clients. After receiving a bath from Geri, clients have a look of pride on the face, and a strong, trusting bond is established between Geri and each of her clients. When Geri is on vacation, clients will say there is no need to send some other staff person and that they can wait for her return to give them a bath. That’s how much they like her! Geri lives St. Francis Healthcare System’s core values of joy, simplicity, peacemaking, and charity. She truly cares about each elder, so joy comes naturally in her presentation and her care. She is constantly aware of the needs the seniors or their caregivers, whether it is a piece of equipment or additional services. Geri responds to those needs immediately so that they can receive enhanced support through St. Francis Healthcare System or other community programs. In fact, her attention to detail and her concern for patients has resulted in early treatment of such conditions as bed sores. Geri may also have even prevented some hospitalizations. Geri always reaches out to welcome new staff members, and has provided valuable insights to make the paperwork and scheduling easier for team members. A new staff member who shadowed Geri, shared that Geri didn’t just focus on showing how she does the task, but also on how bathing is a service that supports seniors and addressed how to build a professional relationship that is genuine to make providing such personal service more comfortable for both the senior and the staff.